The 2017 Ford GT is a high-tech tour-de-force, and Ford does it all with a gasoline engine, lightweight materials and advanced aerodynamics. 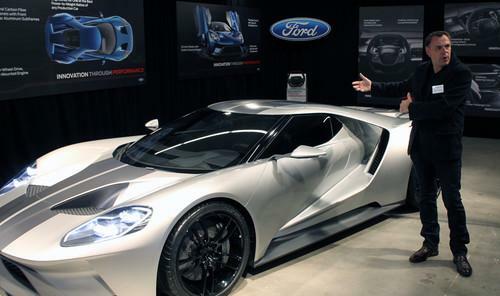 Ford Design Director Chris Svensson gestures to those most lustworthy flying butresses. In fact, the new GT is the most high-tech car Ford has ever created, and it claims that tag without a single parking-assist sensor or lithium-ion propulsion pack. The story here is all about lap times, lap times, lap times: getting from start to finish on twisty race tracks as quickly possible. And to reach that goal, the Ford GT doubles down on aerodynamics and weight reduction, twin byproducts of Ford's most advanced R&D. While the original GT40 (and even its 2005 redux) looked like it was designed by Pops and Sparky, the new Ford GT looks like it was extruded from a HoloLens by a team of physicists and materials scientists. And given Ford's push into cutting-edge, the analogy may not be too far-fetched. I saw a mock-up of the new GT at Ford's Research & Innovation Center in Palo Alto, CA, the heart of Silicon Valley venture capital. Yep, Ford really wants to emphasize that it's as high-tech as Tesla, Google... and maybe even Apple. But what it's doing with the new GT bears zero resemblance to anything we're seeing from Ford's Silicon Valley neighbors. Consider: The Tesla Model S P85D does 0-60 mph in 3.2 seconds. It's an amazing benchmark, but all that raw acceleration, however fast it may be, is still being generated by a 5,000-pound car. This level of avoirdupois has no business being on a race track, and is best reserved for C-suite executives looking to smoke other fat-cat sedans at boulevard stoplights. Ford hasn't yet revealed how fast its 600-plus horsepower engine will pull the new GT off the line. Nor do we know the Ford GT's curb weight. But based on everything we've learned so far, it looks like the car's aero package will generate insane levels of downforce, clamping the GT to pavement on high-speed sweepers, the portions of a race track where essential time is won or lost. And that's a high-tech story about usable speed. The new Ford GT includes 28 processors that chew through more than 10 million lines of embedded system code. Ten of the processors are all new for the GT, and all together the 28 chips generate more than 300MB of data per second. Some of the processors handle mundane tasks like tire-pressure monitoring. But there's also a gyroscope that monitors pitch, roll and yaw (critical for triggering stability and aerodynamic features--all in a seamless fashion that's transparent to the driver). Even the door latches have a processor with logic behind it. Frankly, 28 processors doesn't impress me. If you told me Ford's most advanced production vehicle had 280 processors, I'd shrug and walk away. But once you learn how Ford marries engine tech to aero tech to materials tech, and how all this technology depends on computer logic, the story gets more interesting. Let's start with the engine. Where Porsche, Mclaren and Ferrari are exploring petrol/electric hybrids in their next-gen supercars, Ford opted for an all-gasoline twin-turbo V6. This decision isn't an appeal to the red-meat, muscle car leanings of various Ford fanatics. Rather, the V6 allows for a much smaller footprint, allowing Ford's engineers to "shrink-wrap" the GT's body around the engine, which in turn paves the way for unique aerodynamics--and thus faster cornering and even braking speeds. "The package of the V6 EcoBoost really enabled the aerodynamics," said Raj Nair, Ford's CTO and VP of Global Product Development. "We're able to wrap so tightly around the small V6 block, place intercoolers out in front of the rear tires, and channel the air to the rear. It's allowing us breakthrough levels of very low drag and very high levels of downforce." Check out the photos above and below. Notice how the bodywork fits so snugly to the engine bay. Note the wide channels beneath the flying buttresses, which connect the wheel wells to the rest of the body. The overall shape of the car provides for very low drag (making the GT a slippery object as it cuts through the air--great for sheer speed), but the twin channels also direct air pressure to the car's rear wing, which generates downforce, and thus greater tire adhesion. Now, this is where some of the Ford GT's most interesting computer controls kick in. When the car is in its normal driving mode, the rear wing remains flat in its stowed position. But as driving speeds increase, the wing dynamically rises to its deployed position, increasing aerodynamic drag for straight-line stability, as well as increased grip in high-speed corners. Driving lesson: When you're trying to improve your lap times on a road course, you can find the most time on high-speed sweepers. The tightest, twistiest corners are fun to attack, sure, but if you can increase your cornering speed through a really long sweeper--if only by 3 to 5 mph--your lap times will melt away. You're in these corners for a relatively long time, so even seemingly small speed increases pay dividends. And this is the goal that Ford is reaching for with its aero tech. Everyone loves a fast launch, and quick 0-60 specs do indeed translate to speedy corner exits. But if you really want to be a track-day hero, you'll turn your attention to grip. And you'll also pay attention to braking, which is where Ford completes its aerodynamics story. When you select the new GT's track mode, the rear wing will rise to an "air braking" position, further increasing drag and slowing down the car when you're hard on the brakes. It's all dynamically controlled by the car's holistic computer system. And as soon as you're off the brake pedal, the wing relaxes its grip. I've never driven a turboed engine that didn't suffer at least a little bit of turbo lag, but Ford Performance Chief Engineer Jamal Hameedi told me there isn't any hesitation in the new GT. Apparently turbo lag has been dialed out to the point where the V6 feels like a naturally aspirated engine. For this, we can thank computer logic built into the EcoBoost engine's turbo, cam timing and direct fuel injection systems. In effect, Hameedi said, the GT delivers the same throttle response one might expect from a turboed race car with special anti-lag hardware. In grossly simplified terms, these systems dump fuel directly into the turbo to keep them on boost. "Obviously, you can't do that on a production car--the [catalytic converters] would get a little upset." Hameedi said. "But we're accomplishing that same end goal purely with software operating in the background to keep the turbo spooled. These are complex algorithms that are completely seamless to the driver. All they know is that when they step on the throttle, the turbo and torque is there." The turbos' intercoolers also take advantage of the form-fitting body design, as they're hidden in the haunches of the rear wheel wells. Cool air enters the intercooolers through the front mesh, and then all the hot air that's generated by the intercoolers' heat exchange is routed through the back of the "ring of fire" LED taillights. And here's another high-tech feature that's relatively hidden from view: Not just the tub chassis, but all the GT's body panels are made from high-strength, lightweight carbon fiber. The car features front and rear subframes made of aluminum (another lightweight material), but there's no heavy steel anywhere in the vehicle. The goal here is to chase class-leading power-to-weight ratios--and not just for faster acceleration, but for improved weight transfer and all the handling dynamics that follow. And this isn't just about sprung weight. Unsprung weight even gets the lightweight treatment with 20-inch carbon fiber wheels. Of course, Ford paints over most of the carbon fiber to protect it from the elements, but there are still healthy helpings of exposed weaving to remind onlookers of the GT's high-tech underpinnings. The car's cabin is also carbon-fibered out. The seats are fixed in the carbon fiber passenger cell, so to nail the perfect driving position, you have to either shorten or lengthen the distance of the adjustable steering wheel and pedals. "The dash is a single piece of carbon fiber," said Ford Design Director Chris Svensson. "We're taking away material. The carbon is replacing the steel, and the bits that are wrapped in fabric are breakthrough airbags. It's lightweight to the extreme." There's that word again: lightweight. And that's really what Ford's Silicon Valley technology demo was all about. This most American and old-school of car manufacturers wants to use the Ford GT as living, turbo-breathing demonstration of its forward-thinking tech chops, and plans to trickle down all the weight-saving tricks it developed for the supercar into vehicles normal people might actually buy. To this extent, the GT is a pure platform for innovation. With "small lot runs" like the GT, says Nair, "we can iterate the technologies on a faster basis than what we'd be able to do with a mainstream product." And, of course, lightweight cars consume less gas, and that helps Ford reach ever-more-stringent Federal standards, while also polishing up its green-tech karma points. Still, for the 250 people who will be able to buy the supercar when it arrives in 2016, we have to assume most of them will be concerned about ultimate performance, not fuel efficiency. I can't wait to see whether the GT breaks a record at Nürburgring. Because that's really what Ford is chasing here, if we're being honest.